Western blot analysis of extracts from various cell lines using beta-Arrestin 1/2 (D24H9) Rabbit mAb. 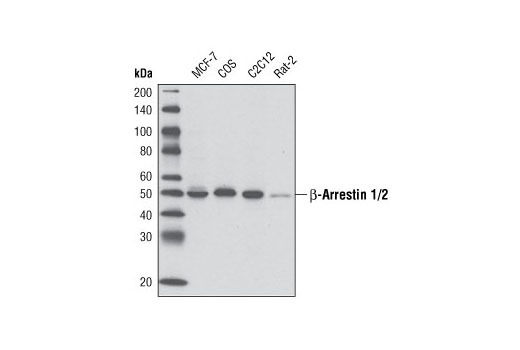 β-Arrestin 1/2 (D24H9) Rabbit mAb detects endogenous level of total beta-arrestin 1 and beta-arrestin 2 proteins. Monoclonal antibody is produced by immunizing animals with a recombinant protein containing the carboxy-terminal region of human β-arrestin 1. Zhao, K.W. et al. (2015) J Cell Biochem 116, 767-77.